"Moderate Unicorns," huffed a reader, responding to my recent plea that Western states bolster moderate Muslims. Dismissing their existence as a myth, he notes that non-Muslims "are still waiting for moderates to stand and deliver, identifying and removing extremist thugs from their mosques and their communities." It's a valid skepticism and a reasonable demand. Recent events in Pakistan and Turkey, however, prove that moderate Muslims are no myth. In Pakistan, an estimated 100,000 people demonstrated on April 15 in Karachi, the country's largest city, to protest the plans of a powerful mosque in Islamabad, the Lal Masjid, to establish a parallel court system based on Islamic law, the Shari'a. "No to extremism," roared the crowd. "We will strongly resist religious terrorism and religious extremism," exhorted Altaf Hussain, leader of the Mutahida Qaumi Movement, at the rally. In Turkey, more than a million moderate Muslims in five marches protested the bid of the Justice and Development Party (AKP) to take over the presidency of the republic, giving it control over the two top government offices (the other being the prime ministry, currently filled by Recep Tayyip Erdoğan). 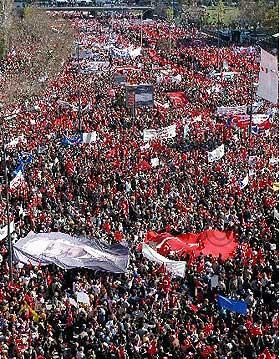 The Ankara march of April 14, 2007. The first march took place in the capital city, Ankara, on April 14, organized by Şener Eruygur, a former general who is president of the Atatürk Thought Association. An estimated 300,000 secularists (i.e., moderate Muslims) held up banners with pictures of the republic's founder, Mustafa Kemal Atatürk, chanting slogans along the lines of "We don't want an imam as president," "We respect belief, but not radicalism," and "Turkey is secular and will stay secular!" A young woman carrying a huge Turkish flag, Muge Kaplan, explained that the crowd is Muslim and believes in Islam, but it doesn't want Islam "to become our whole way of life." A farmer, Bülent Korucu, asserted that the crowd is defending its republic "against religious fundamentalists." Repeating these themes, a second march on April 29 in Istanbul boasted 700,000 marchers. On May 5, smaller marches took place in the western Anatolia towns of Manisa, Çanakkale, and Marmaris. Nor are the masses alone in resisting AKP's Islamists. President Ahmet Necdet Sezer warned that, for the first time since 1923, when the secular republic came into being, its pillars "are being openly questioned." He also inveighed against the imposition of a soft Islamist state, predicting that it would turn extremist. Onur Öymen, deputy chairman of the opposition Republican People's Party, cautioned that the AKP's taking the presidency would "upset all balances" and create a very dangerous situation. The military – Turkey's ultimate powerbroker – issued two statements reinforcing this assessment. On April 12, the chief of staff, Gen. Mehmet Yaşar Büyükanıt, expressed his hope that "someone who is loyal to the principles of the republic—not just in words but in essence—is elected president." Two weeks later, the military's tone became more urgent, announcing that the presidential election "has been anxiously followed by the Turkish Armed Forces [which] maintains its firm determination to carry out its clearly specified duties to protect" secular principles. This resolute stand against Islamism by moderate Turkish Muslims is the more striking when contrasted with the cluelessness of Westerners who pooh-pooh the dangers of the AKP's ascent. A Wall Street Journal editorial assures Turks that their prime minister's popularity "is built on competent and stable government." Dismissing the historic crossroads that President Sezer and others perceive, it dismisses as "fear mongering" doubts about Prime Minister Erdoğan's commitment to secularism and ascribes these to petty campaign tactics "to get out the anti-AKP vote and revive a flagging opposition." "Even if Erdoğan walked on water, the secularists wouldn't believe him," observes a former American ambassador to Turkey, Morton Abramowitz. Olli Rehn, the European Union's "enlargement commissioner," instructed the Turkish military to leave the presidency election in the hands of the democratically-elected government, calling the issue "a test case" for the armed forces to respect its political masters, a position the U.S. government subsequently endorsed. Is it not telling that great numbers of moderate Muslims see danger where so many non-Muslims are blind? Do developments in Pakistan and Turkey not confirm my oft-repeated point that radical Islam is the problem and moderate Islam the solution? And do they not suggest that ignorant non-Muslim busybodies should get out of the way of those moderate Muslims determined to relegate Islamism to its rightful place in the dustbin of history? 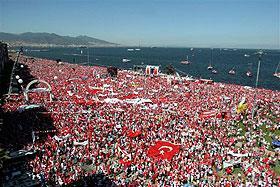 The pro-secular demonstration in Izmir on May 13, 2007, bigger than all the prior ones combined. May 10, 2007 update: I called them "ignorant non-Muslim busybodies" above but Youssef Ibrahim goes further in a New York Sun column today: "useful idiots." May 13, 2007 update: An estimated 2 million moderate Muslims took to the streets this afternoon in Izmir, Turkey's third largest and most secular city. I happen to be in Istanbul, Turkey and watched the event live at length on television, listening to the songs and witnessing the crowd's fervor.